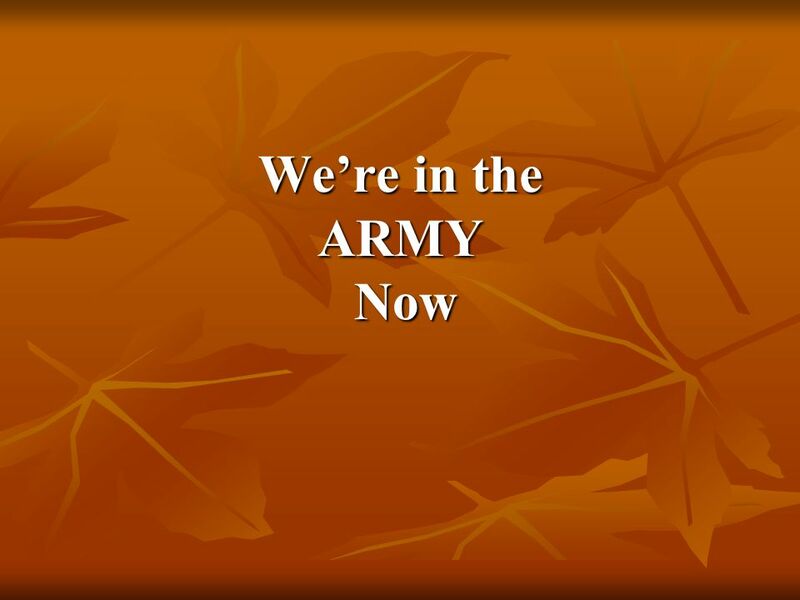 We’re in the ARMY Now We’re in the ARMY Now. 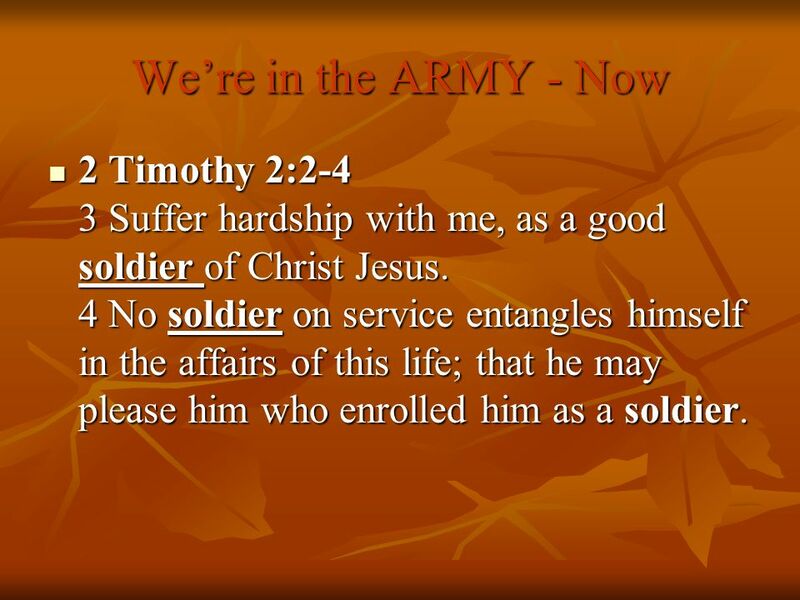 3 We’re in the ARMY - Now 2 Timothy 2: Suffer hardship with me, as a good soldier of Christ Jesus. 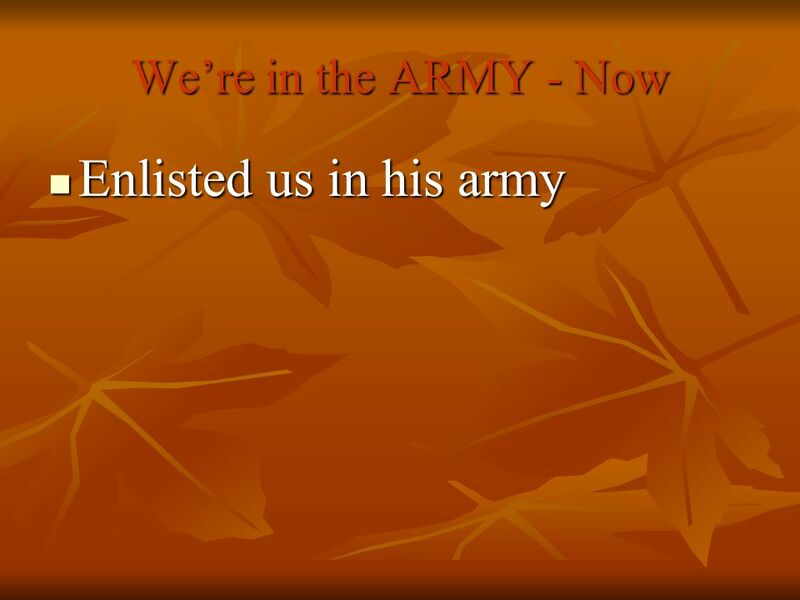 4 No soldier on service entangles himself in the affairs of this life; that he may please him who enrolled him as a soldier. 2 Timothy 2:2-4 (ASV) 2 And the things which thou hast heard from me among many witnesses, the same commit thou to faithful men, who shall be able to teach others also. 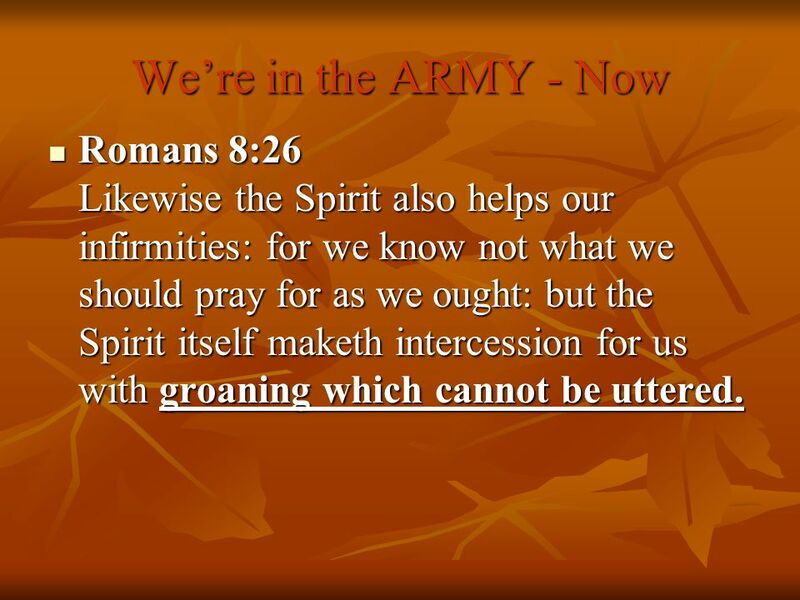 3 Suffer hard ship with me, as a good soldier of Christ Jesus. 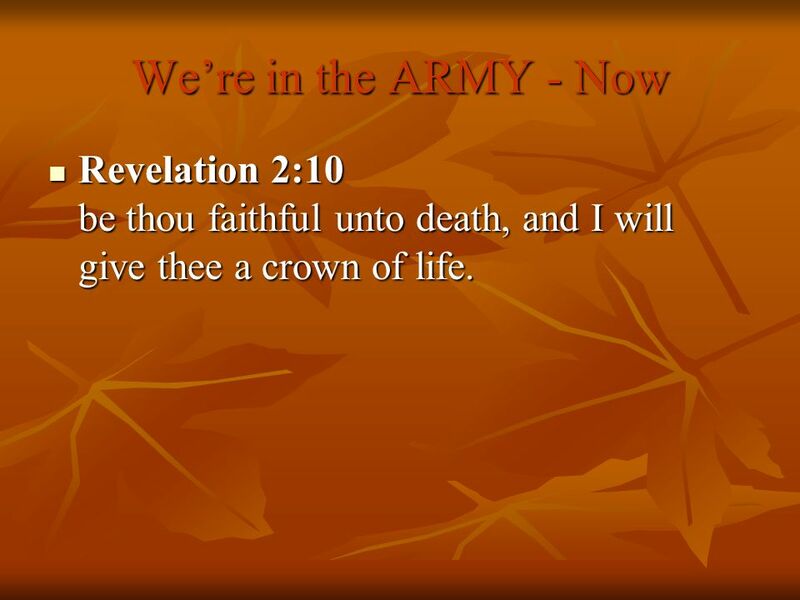 4 No soldier on service entangles himself in the affairs of this life; that we may please him who enrolled him as a soldier. 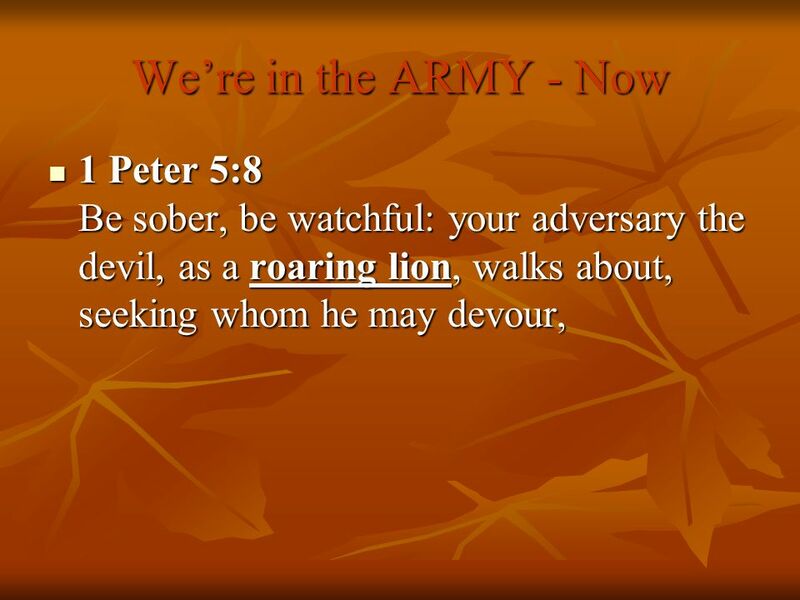 8 We’re in the ARMY - Now 1 Peter 5:8 Be sober, be watchful: your adversary the devil, as a roaring lion, walks about, seeking whom he may devour, 1 Peter 5:8 (ASV) Be sober, be watchful: your adversary the devil, as a roaring lion, walking about, seeking whom he may devour, Just like the IEDs (Improvised Explosive Devices) hidden along the highways Satan may plant unseen spiritual roadside bombs when we least expect them He may lure us with secret sins – seemingly harmless – but very deadly Martin Luther once likened Satan to a: “snarling dog that is chained in place, who can only do you harm if you’re foolish enough to come too close.” In the military this “getting to close” is termed “fraternizing with the enemy” A soldier who associates with the enemy is despised and disgraced We dare not get too close to sin. 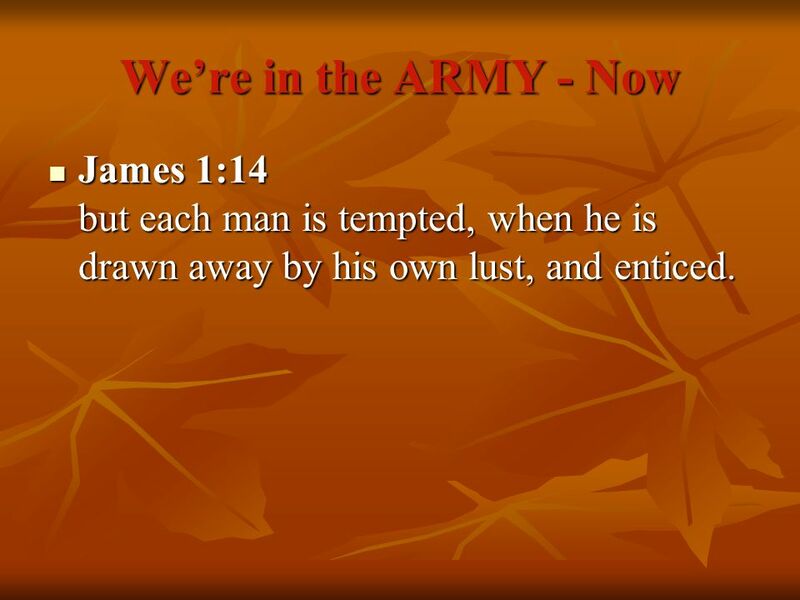 10 We’re in the ARMY - Now James 4: Be subject therefore unto God; but resist the devil, and he will flee from you. 8 Draw nigh to God, and he will draw nigh to you. 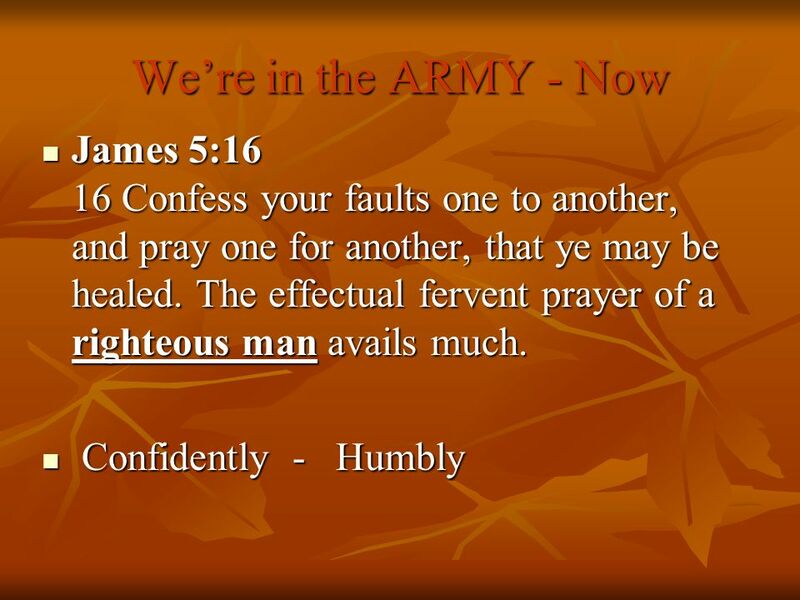 Cleanse your hands, ye sinners; and purify your hearts, ye double minded. 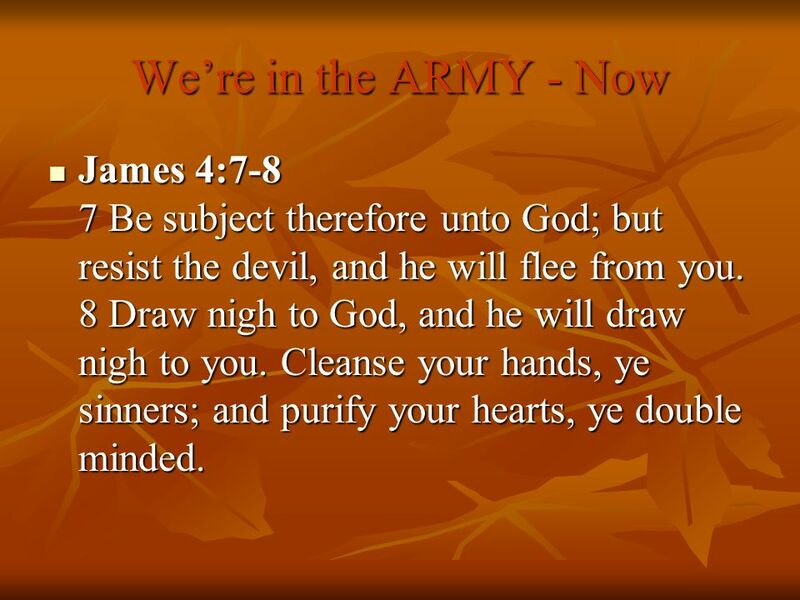 James 4: Be subject therefore unto God; but resist the devil, and he will flee from you. 8 Draw nigh to God, and he will draw nigh to you. Cleanse your hands, ye sinners; and purify your hearts, ye double minded. 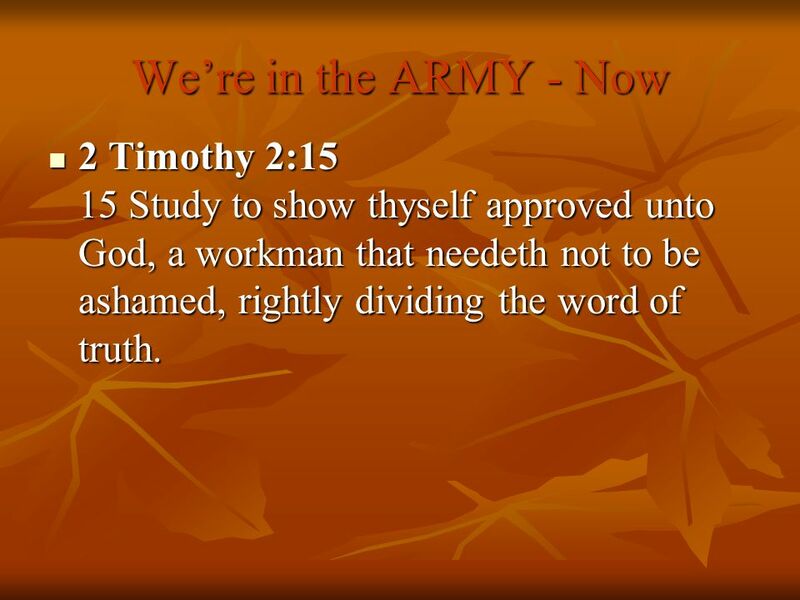 12 We’re in the ARMY - Now 1 Timothy 4:7 7 but refuse profane and old wives' fables. 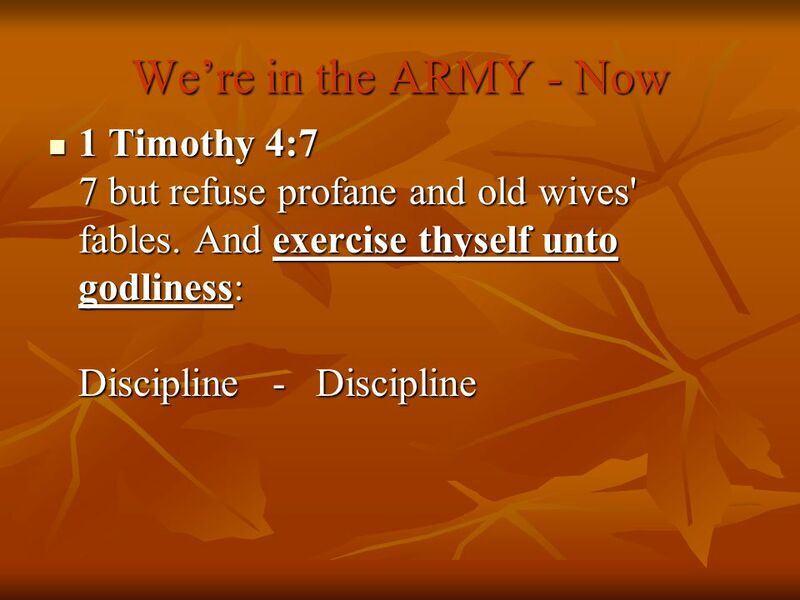 And exercise thyself unto godliness: Discipline Discipline 1 Timothy 4: But refuse profane and old wives' fables. 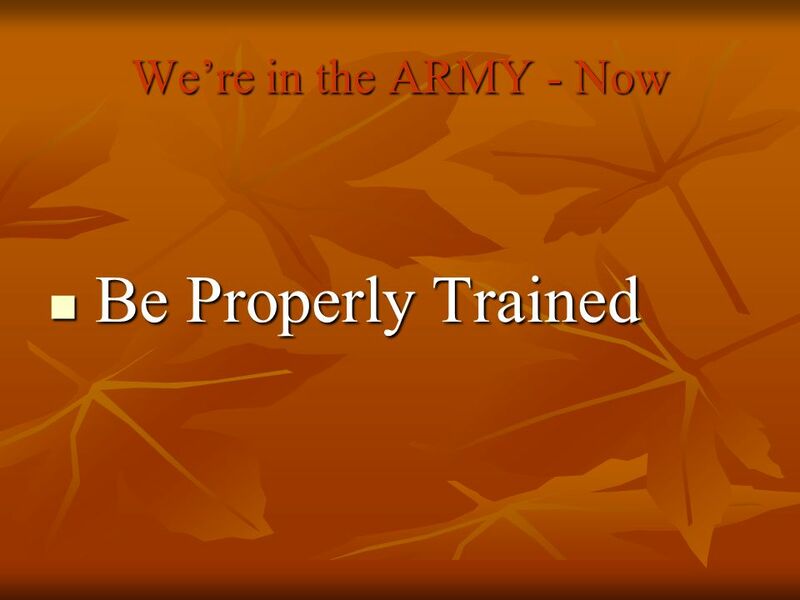 And exercise thyself unto godliness: It takes discipline to become a good soldier and keep yourself from the enemy It takes discipline to become a good soldier in the Lord’s army It just is not enough to show up late for training and expect to be a good soldier. 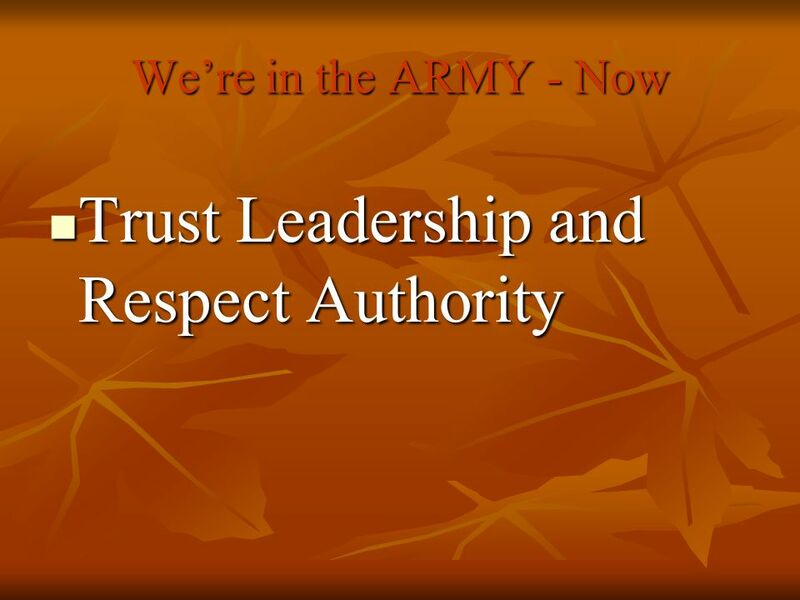 In mans army or the Lord’s army. 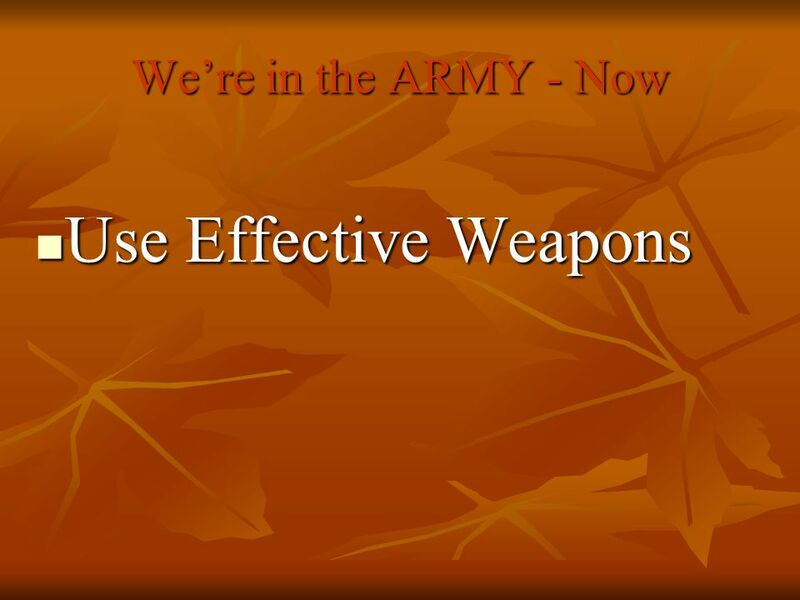 Our soldiers use the most sophisticated weapons available to combat the enemy That might mean bringing out heavy artillery like missiles and tanks. It would be very ineffective for the soldier to engage the enemy with a hand grenade When a missile is needed. It’s the same with us. 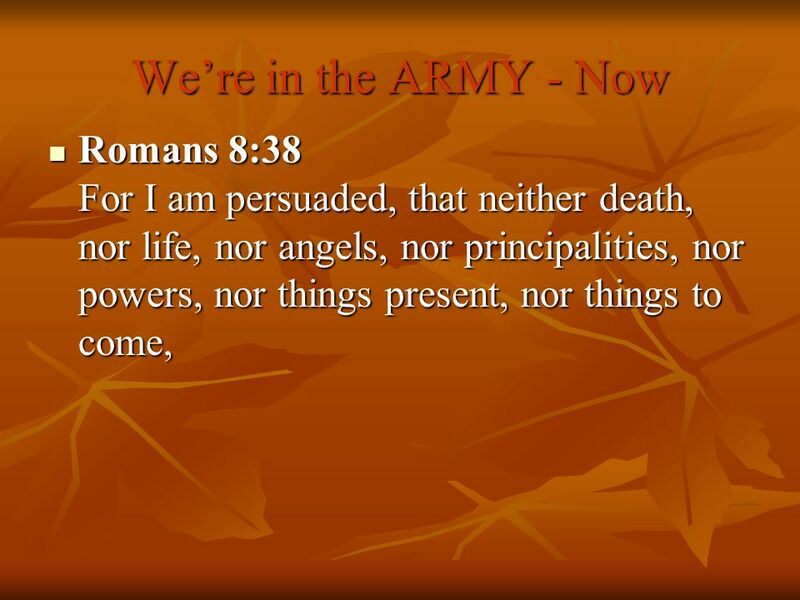 The Lord has not left us defenseless or powerless We have all the needed armor. 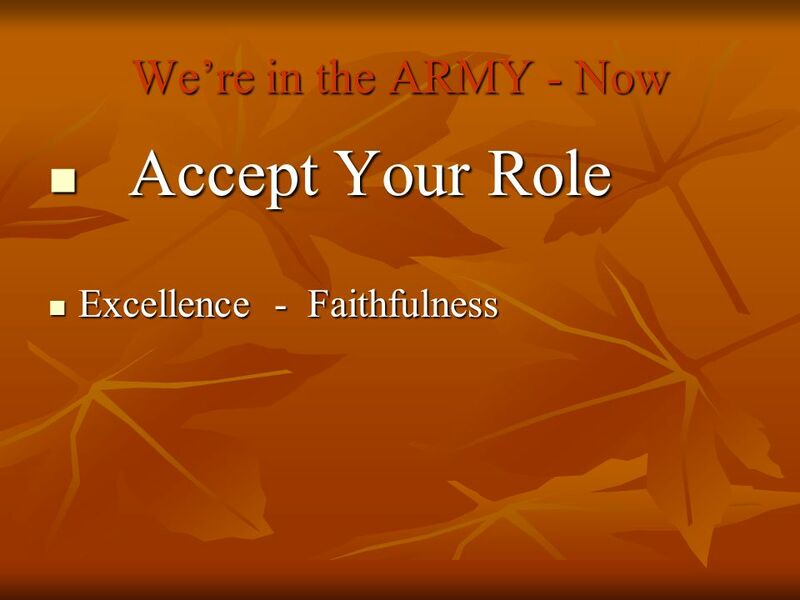 In the Army, a private is not expected to perform as on officer However, both have important duties that are essential in fight the battle Not all will be teachers, preachers, Deacons or Elders, but all have responsibilities There are NO unimportant soldiers in the Lord’s army Strive for ► excellence and faithfulness where ever you are needed Be as faithful in the Lord’s army as you are to you wife, your job, or your school attendance We all need to be present at all the assemblies or the training sessions. 29 Are you in the Army now? 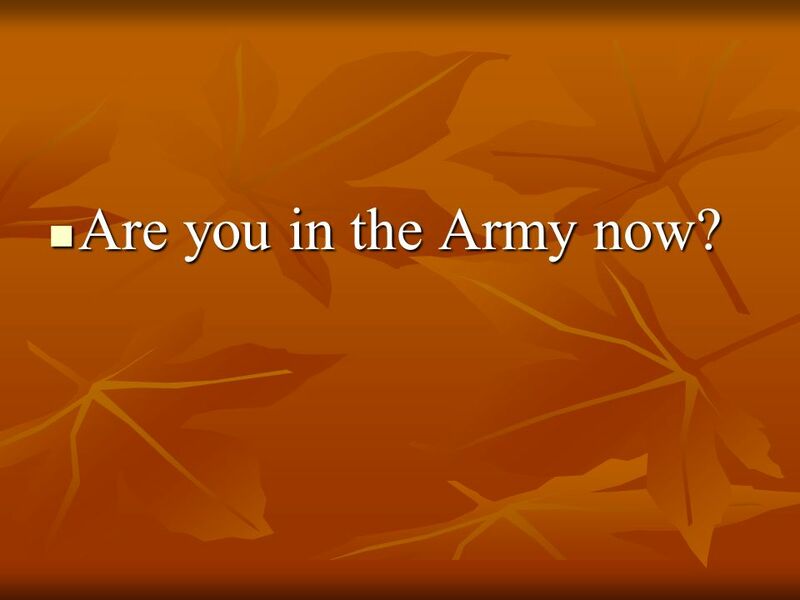 Are you in the Army now? 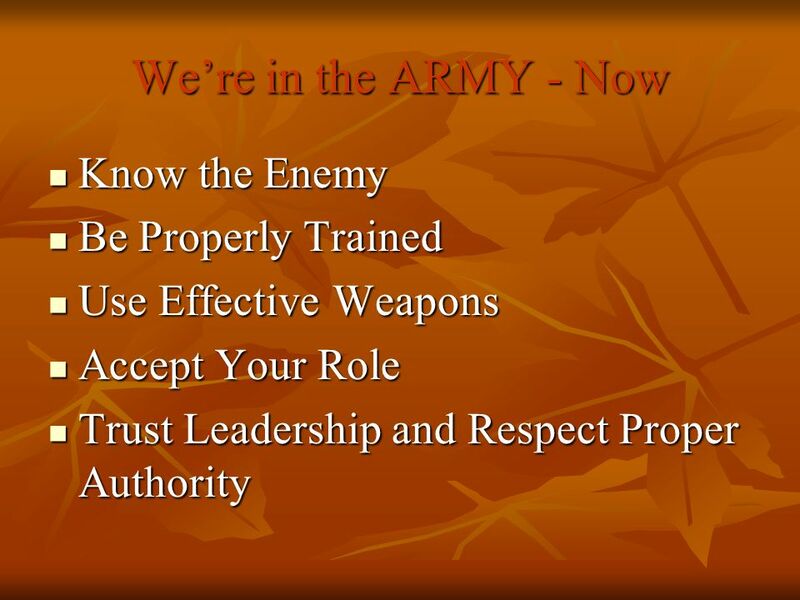 Download ppt "We’re in the ARMY Now We’re in the ARMY Now." 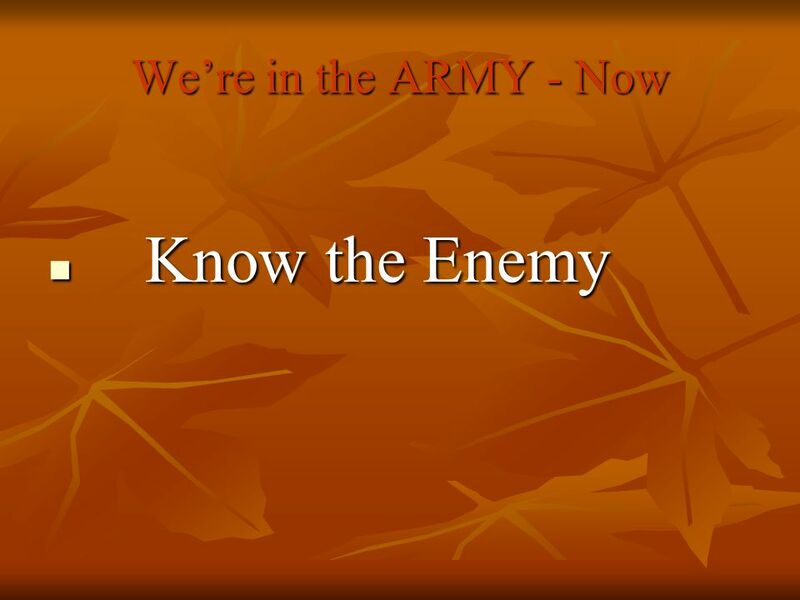 SPIRITUAL WARFARE Today’s topic Let me tell you a story . . . 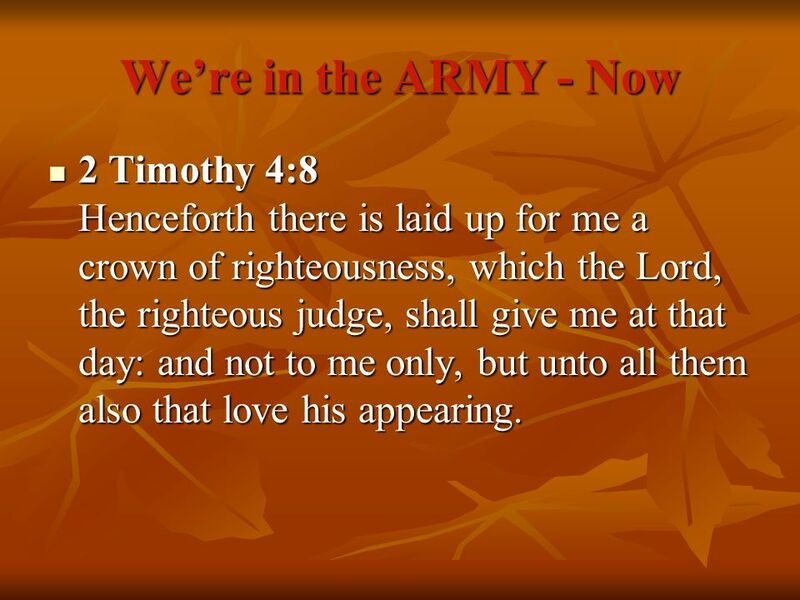 Preparing the Christian soldier This charge I entrust to you, Timothy, my child, in accordance with the prophecies previously made about you, that by. Ephesians 6: Finally, be strong in the Lord and in the strength of his might. 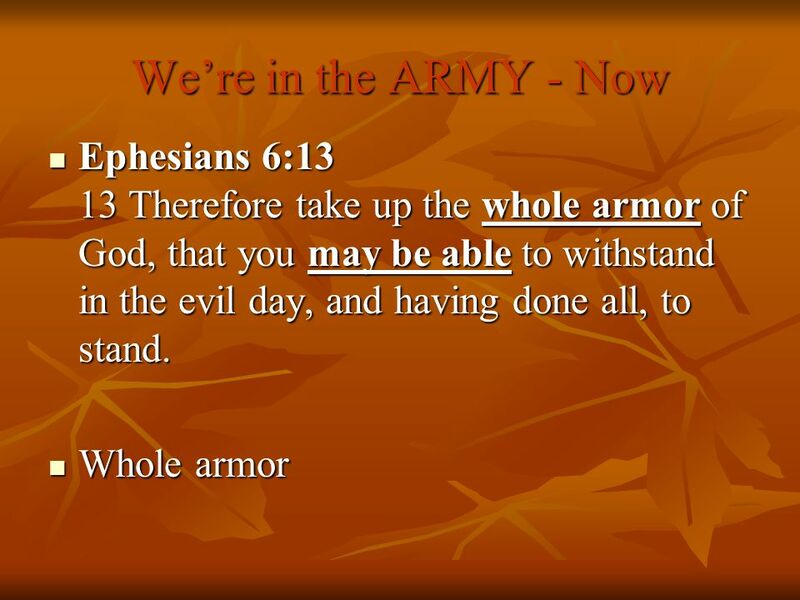 11 Put on the whole armor of God, that you may be able to stand. No Retreat NO SURRENDER II. 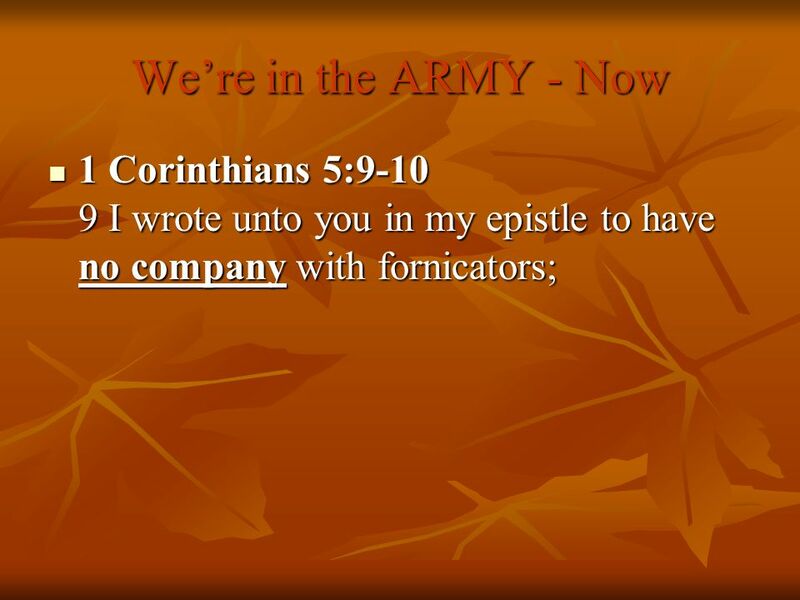 TOOLS FOR SPIRITUAL WARFARE Ephesians 6:10-18 Margaret Lepke ~ Please click to forward slides at your own leisure. 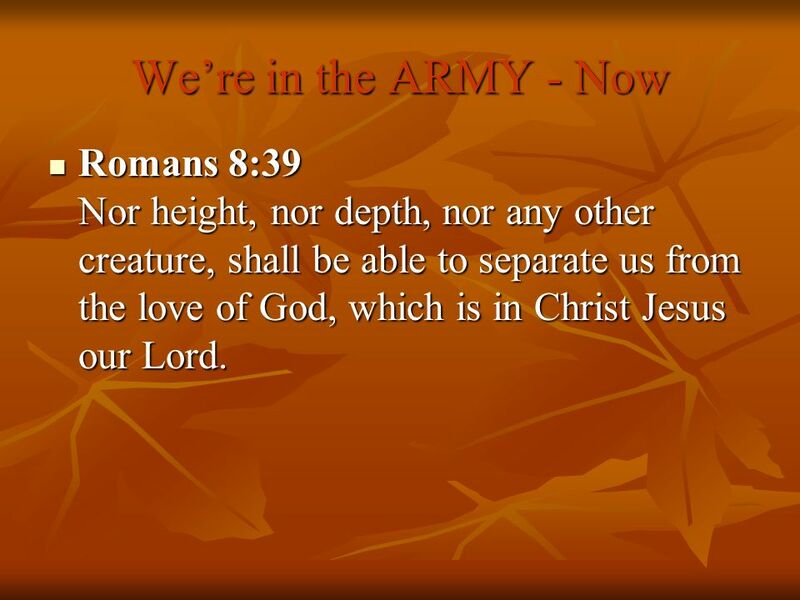 A soldier of Christ By Chanakya Sehgal. Ephesians 6 : Finally, my brethren, be strong in the Lord and in the power of His might. 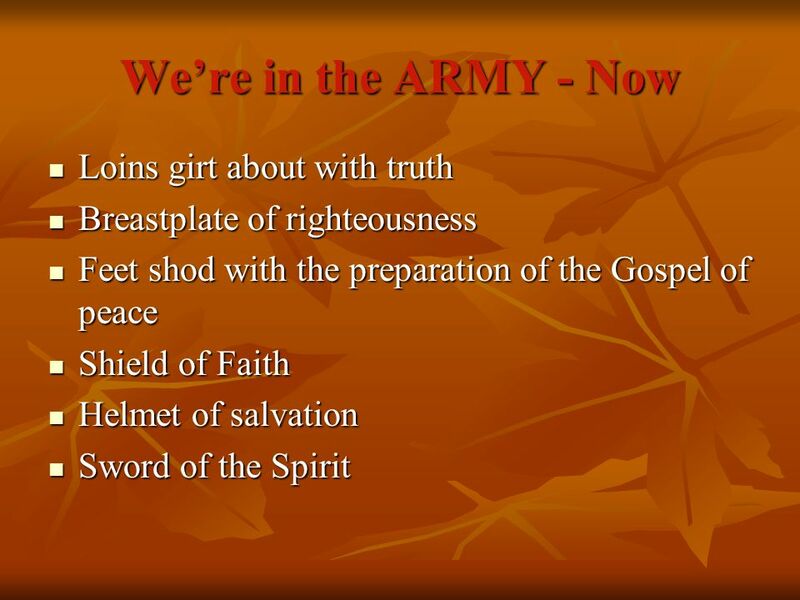 11 Put on the whole armour of God, that you may be. Soldiers of the Cross Marching Philippians 3:14 I press toward the mark for the prize of the high calling of God in Christ Jesus. The Courage of Our Convictions 1 Corinthians 16:13-14. Category This group of slides has been designed to assist students endeavoring to memorize the scripture passages chosen by The National Bible Bee. Eph 6: Finally, my brethren, be strong in the Lord and in the power of His might. 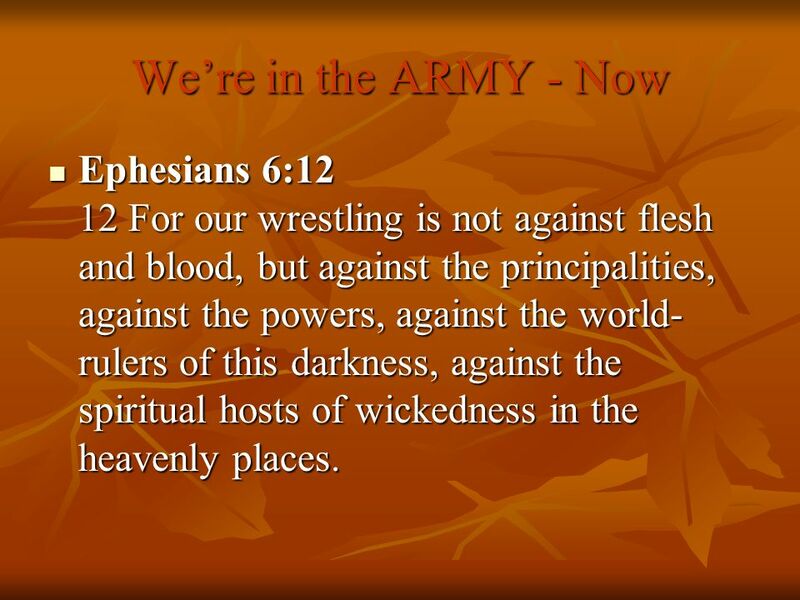 Put on the whole armor of God, that you may be able to stand against. The Voice of Satan Lesson 4 Resisting Satan’s Voice Today. 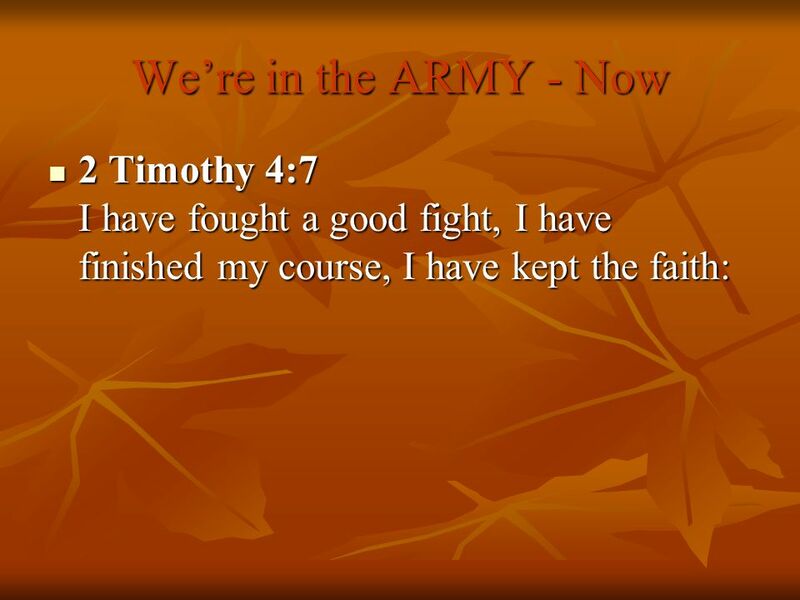 Put On The Whole Armor Of God Wage The Good Warfare 1 Timothy 1:18 This charge I commit to you, son Timothy, according to the prophecies previously made. Wednesday Night in the Word June - August. Eph 6: Finally, my brethren, be strong in the Lord, and in the power of his might. 11 Put on the whole. 5. Eph. 6:10-12; Finally, my brethren, be strong in the Lord and in the power of His might. 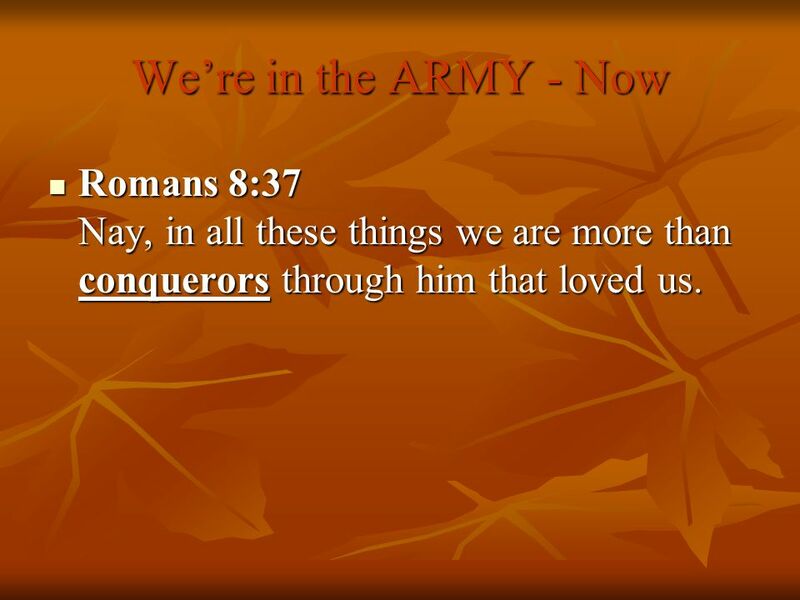 Put on the whole armor of God, that you may be able to stand. 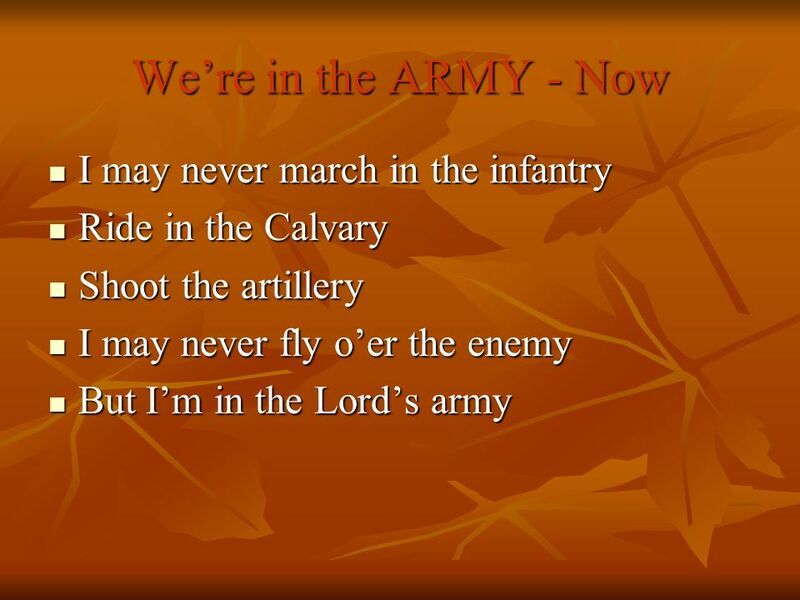 (Eph 6:10-17) Off to war we go! I.The POSITION of defense.